The steps to take in shrinking your energy consumption and carbon footprint. Links to more information about energy efficiency and renewables. Energy consumption for heating is one of the main sources of our carbon emissions. Although rain seems plentiful, the climate is getting more erratic and the likelihood of drought is increasing. Read your meters regularly, and understand how you use energy. Considering buying an electricity monitoring device – inexpensive, easy to use, and could help you save 40% on energy bills. Calculate your carbon footprint on the WWF Footprint Calculator, and find out how to reduce it. Cultivate energy-saving habits, e.g. turning lights off when you leave rooms. Improve the energy efficiency of your house. Switch to an electricity supplier that provides renewable energy, such as Ecotricity or Good Energy; take the ‘Big 6′ energy suppliers’ green products with a pinch of salt. Generate your electricity or heating from renewable sources, and get paid for it. Supply renewable electricity back to the grid, and get paid even more. Wasting energy is an excellent way of wasting money. Many households can save energy by taking some very simple actions, and investment in energy-efficiency measures such as lighting or insulation will pay itself back very quickly. Installing basic energy-efficiency measures is a prerequisite for obtaining grants for renewable energy projects. “Take action” – how to get started with energy saving. Insulation, all things heating and hot water, and all things electricity. The Government’s Green Deal and ECO schemes. Other grants and discounts – note that many have eligibility rules, and might be open only to people over 60, or with children under 16, or on benefits. YouGen provides guidance on energy efficiency, and maintains a searchable database of suppliers, installers, consultants, architects and manufacturers, with ratings by previous customers. And you can also search the database for individuals who have installed energy-efficiency measures. Generating your own electricity or heating looks increasingly attractive as energy prices rise, and we rely on fewer countries to supply our oil and gas. Wind, sun and water are abundant and free sources of renewable energy. It makes sense to use them to make your own heat and power. The Energy Saving Trust provides guidance on generating your own energy. YouGen provides guidance on the different technologies (and also on combined heat & power and rainwater harvesting). It maintains a searchable database of suppliers, installers, consultants, architects and manufacturers, and enables customers to rate them. And you can also search the database for individuals who have installed renewables. The government provides some financial support for renewables technologies. Feed-in Tariffs provide payments for electricity generated from renewable sources and supplying electricity to the grid. 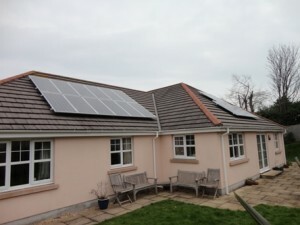 The Renewable Heat Premium Payment helped with the cost of installing renewable heating technologies, but has now been replaced by the Renewable Heat Incentive, providing payments for the heat generated similar to the Feed-in Tariffs. If like me, the installation of a ShowerSave reduces the flow rate by about 2 litres per minute, that saves 10 litres for each 5 min shower. If you use a Hippo in your toilet cistern, also available free from South West Water [or your own water company], that saves 3 litres per flush on pre-1992 toilets. Hippos and ShowerSave devices take about 5 minutes to install. Assuming you flush 6 times a day in the house, the saving is 18 litres per day, 6,570 litres or £11.03 per year. The saving could be 1 litre each time, say 5 times per day, another 1,825 litres or £3.06 per year. Try using a bucket to wash your car each month or watering can to water the garden each week instead of using a hose for 15 minutes. That means using about 10 litres instead of 250 litres, so you’d save 2,880 litres and 12,480 litres respectively, adding up to £25.27 per year. I reckon most of these are reasonably conservative, and there are various other efficiency measures, such as not leaving taps running, using only full and efficient dishwashers/washing machines – see Save Water Save Money for ideas. Add it all together and I save 31,055 litres each year, or £52.15 off the Diocese’s water bill, for one clergy house. Assuming 200 stipendiary clergy that’s a £10,340 saving each year, almost half an incumbent’s stipend!